For my first hike in the project, I chose the highest peak: Slide Mountain. Its attraction is also that it can be done in a loop with an overnight stop partway. My companion, as in previous trips, was Roy Samras. 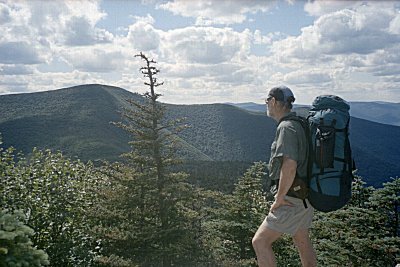 Like me, he was unable to take much vacation this year and was interested in accompanying me on a series of shorter nearby hikes. The drive up was pleasant, with warm sunny weather. I needed to stop to get a map, and was dismayed to find that Phoenicia was jammed with visitors. Fortunately most of them were drawn by the shopping or tubing, not the hiking. 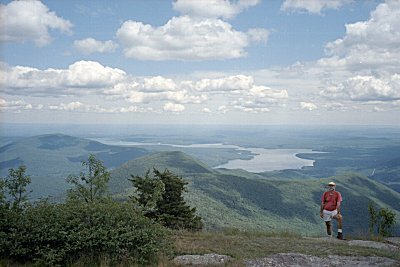 Like many of the Catskill peaks, the trail begins with a stiff climb to a ridge, then goes up and down along the ridge. The trailhead is near a very pretty creek with a delightful state campground. The trails in the Catskills always surprise me because, compared to the trailmaking standards of the National Park Service, they are steep, narrow, and rocky. 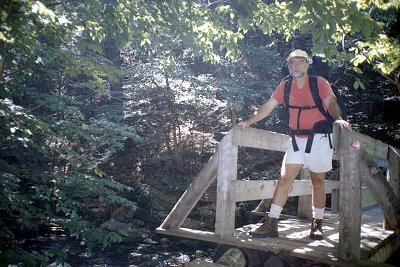 The trail up Wittenberg was no exception  it rose steeply at first, then cliffs alternated with gradual uphill sections. It was hot, but there were no bugs and the shade made hiking pleasant. We saw a few dayhikers, who charged past us. 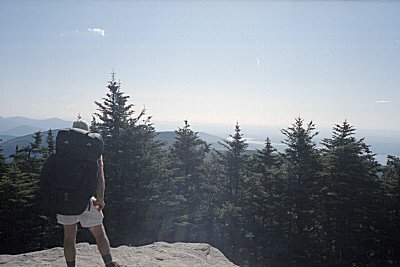 With our backpacks, we were moving more slowly than the dayhikers. The view from Wittenberg was magnificent  the reservoir and the valley that we had driven up were laid out at our feet. We stopped at the viewpoint for lunch, and had it all to ourselves. 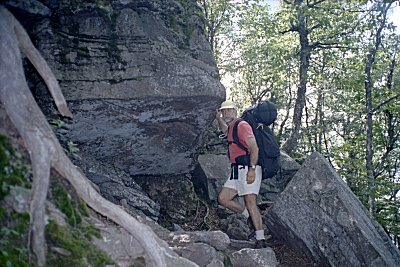 The trail to Cornell, which did not seem to strenuous on the map, was full of cliffs to descend and ascend again. By the time we descended into the saddle between Cornell and Slide we were ready to call it a day. Water was a problem though. I had counted on finding water (there was a spring marked), so I consumed all I had. We passed the location of the spring, doubled back, and crisscrossed it a few more times. We ran into another party that was looking for water also. There were a few damp spots, with little puddles of standing water, but nothing that looked drinkable. Finally, I located a tiny spring with a trickle of flowing water near the trail, and carefully filtered a few bottles of water. We stayed at a charming but well-used campsite on the ridge. So it did not surprise me to hear a porcupine rustling around in the middle of the night. I threw stones at it, shined the light on it, yelled at it, each time causing it to screech and holler and scurry off for a few minutes. Eventually I put everything in the tent, zipped up, and tried to ignore it. The next morning, Roy, who was sleeping 15 feet away, said he had heard nothing all night long. The last climb up Slide was again steep, but this time there were steps and ladders, making it much easier to get up the cliffs. The spring below the peak was delightful. The view from the peak was far ranging, but limited by a general haziness. The way down was a completely different experience  a wide, gentle trail and all downhill. We ran into another hiker couple heading out, who offered us a ride from the Slide parking lot to the next trailhead, saving us a few miles of hiking on the road. I really appreciated that, because I was developing blisters, and because the road was so much hotter than hiking in the shade of the forest. The return portion of the hike was picturesque, but I am afraid we were too much looking forward to getting back to enjoy it much. We again saw a handful of people dayhiking, but no more backpackers. The trail continued to be wide, moderately downhill in most places, and easy going. We arrived back at the cars in early afternoon, a little sore but glad to be back.